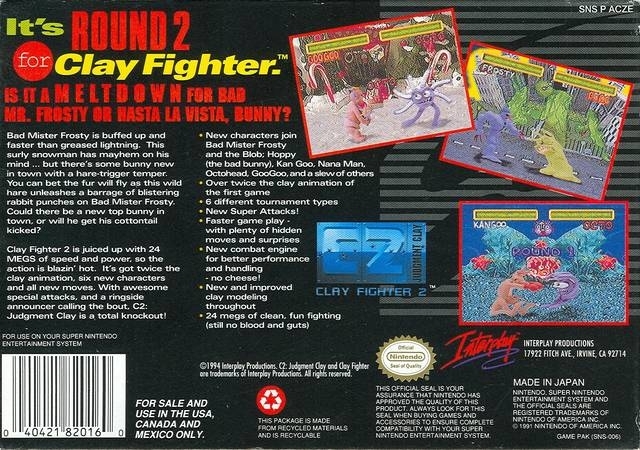 It's ROUND 2 FOR Clay Fighter. Is It a M E L T D O W N for Bad Mr. Frosty or Nasta La Vista, Bunny? Bad Mister Frosty is buffed up and faster than greased lighting. This surly snowman has mayhem on his mind ... but there's some bunny new in town with a hare-trigger. You can bet the fur will fly as this wild rabiit punches on Bad Mister Frosty. Could there be a new top bunny in town, or will he get his cottontail kicked? 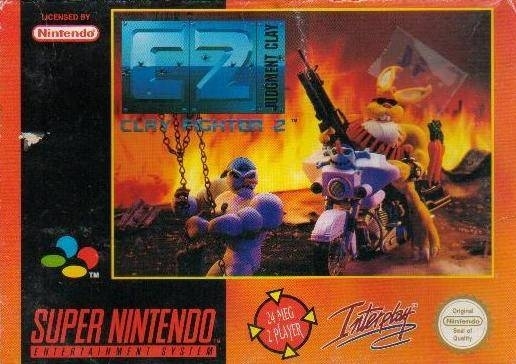 Clay Fighter 2 is juiced up with 24 MEGS or speed and power, so the action is blazin' hot. It's got twice the clay animation, six new characters and all new moves. With awesome special attacks, and a ringside announcer calling the bout. C2: Judgement Clay is a total knockout! New combat engine for better performance and handling - no cheese!